Because of the weak order situation, the Austrian construction group dismisses up to 380 employees at the Czech location. 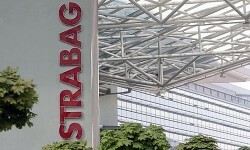 The Strabag group currently employs 2,500 employees in the Czech Republic. Of these, 10 to 15% are to be laid off, according to reports by the Czech media, owing to weak orders. The workforce is to be reduced to the same extent as the decline in orders, affecting mainly temporary and seasonal workers.